Find full-text books and other publications, including travel guides and journals, railroad documents, recreational trails plans, and other historic publications. Art Work of Omaha, 1896. Published in nine parts by the W. H. Parish Publishing Company, Chicago IL, the text focuses on community promotion and accompanies approximately eighty images of early Omaha. The Cowboy Trail Master Plan: A Collaboration Between the Rails-To-Trails Conservancy and The Clark Enersen Partners , February 1997. The Cowboy Trail, the nation's longest rail to trail conversion, was once part of the Chicago & North Western Railroad's Cowboy Line. The route covers 321 miles across northern Nebraska from Norfolk to Chadron. This Master Plan describes the trail development and planning process. Crofutt's Trans-Continental Tourist's Guide, George A. Crofutt, 1871. This publication contains a description of more than five hundred cities, towns, villages, stations, government forts and camps, mountains, lakes, rivers, sulphur, soda and hot springs, scenery, watering places, and summer resorts from the Atlantic to the Pacific Oceans. The Geography Of The Oregon Trail In Nebraska: A Thesis Presented to the Faculty of The Graduate College in the University of Nebraska in Partial Fulfillment of Requirements for the Degree of Master of Arts Department of Geography Lincoln, Nebraska, Mildred Krouch, May 1933. Guide To The Union Pacific Railroad Lands, Union Pacific Railroad Company, 1870. "12,000,000 acres best farming and mineral lands in America, for sale by the Union Pacific railroad company, in tracts to suit purchasers and at low prices." Incidents Of A Trip Through The Great Platte Valley To The Rocky Mountains And Laramie Plains , Silas Seymour, 1867. "...in the fall of 1866, with a synoptical statement of the various Pacific railroads, and an account of the great Union Pacific railroad excursion to the one-hundredth meridian of longitude." Nebraska Nature Trails, Ruth Fleming, Nature Specialist, for the Federal Works Agency Works Project Administration Recreation Program, 1938. This publication instructs the nature enthusiast in "the laying and enjoying of a marked trail in the woods or across the prairie." 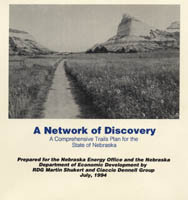 A Network of Discovery: A Comprehensive Trails Plan for the State of Nebraska, RDG Martin Shukert and Ciaccio Dennell Group, for the Nebraska Energy Office and the Nebraska Department of Economic Development, July 1994. To build on the recreational trails movement in Nebraska and to promote recreational travel that does not use fossil fuels, the Nebraska Energy Office commissioned the preparation of this document. The plan provides a statewide framework for trails planning and development efforts. Paine Travel Journals, Bayard H. Paine, 1889. "This book contains an acct. of the Experiances[sic] and exploits of the young man, Bayard H. Paine while on a tour in North Western Nebraska." Reese Remembrances, Norman Reese, 1916. "The Reminiscences of a Hall county Pioneer Depicting, in Plain But Highly Interesting Narrative, Life and Its Trials, As Also Its Pleasures and Joys, When the Place in Which We Now Live Was a Mere Wilderness." A Story of Highway Development in Nebraska By George E. Koster, Project Development Division of the Nebraska Department of Roads, 1997. An updated and expanded version of a 1986 edition by the author, written in informal style without bibliography or footnotes. It traces the development of roads in Nebraska from the first county road law passed in 1856 to the completion of Interstate 680 in 1975, along with the evolution of the Department of Roads from the Office of Road Inquiry in 1903 to its present organization. Many quotations from interviews with former highway workers are included. The Union Pacific Railroad: A Trip Across The North American Continent From Omaha To Ogden, Nelson's Pictorial Guide-Books, 1871. Supported in part by funding from the Institute of Museum and Library Services, administered by the Nebraska Library Commission.